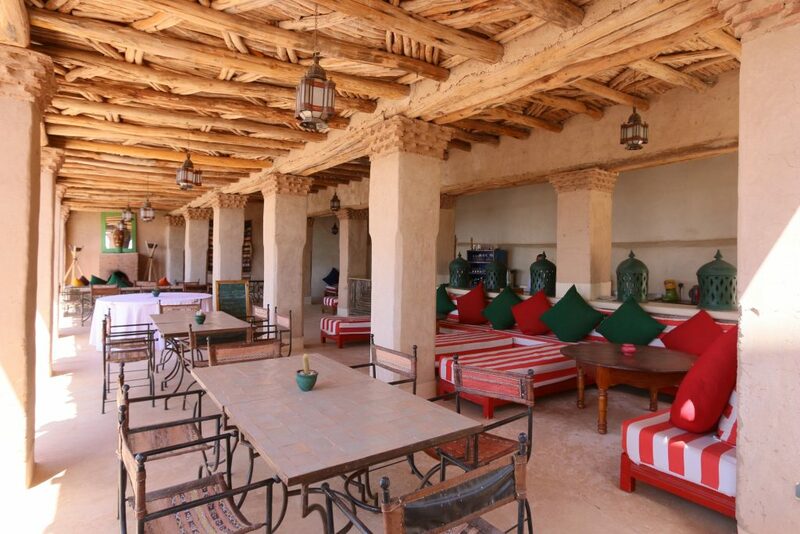 Enjoy a late summer break at Tigmi situated just outside Marrakech. Set within beautiful grounds, Tigmi is a luxury hotel and retreat for us to practice our yoga and enjoy the amazing Moroccan hospitality. 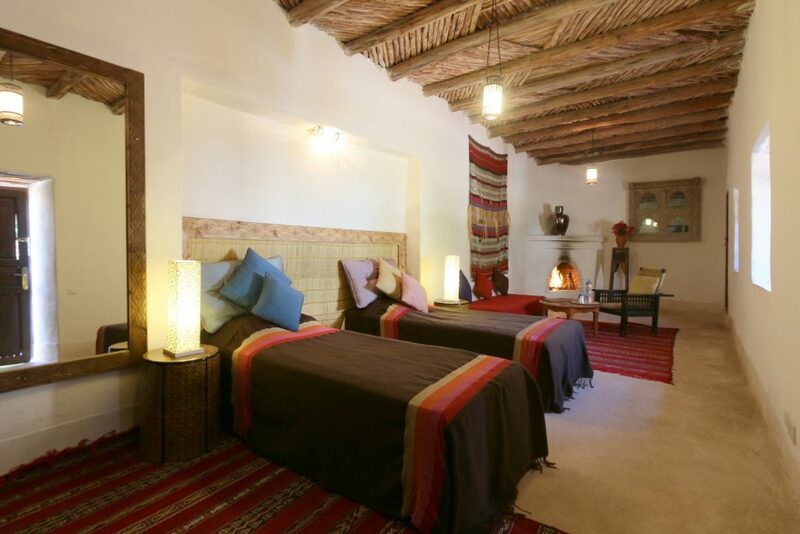 Meandering corridors and courtyard paths lead to authentically-furnished, comfortable rooms. You’ll enjoy secret terraces, charming gardens and a myriad of quiet corners in which to relax, read and recharge. During your stay, Tigmi’s grounds are yours to explore and savour. Winding paths lined with banana palms and citrus trees lead you around the beautiful gardens. Roses, hibiscus and bougainvillea bring a delicate aroma and add bursts of colour to Tigmi’s garden walls. Bask in the sun, or seek out the shade. You’ll find both in abundance. The terrace offers stunning views of the Atlas Mountains and is home to the first of Tigmi’s two pools – perfect for cooling off with a quick dip, or stretching your legs with a relaxing swim. In a shady, secluded garden, you’ll find the second pool. Solar heated all year to 26 degrees and surrounded by comfortable divans. 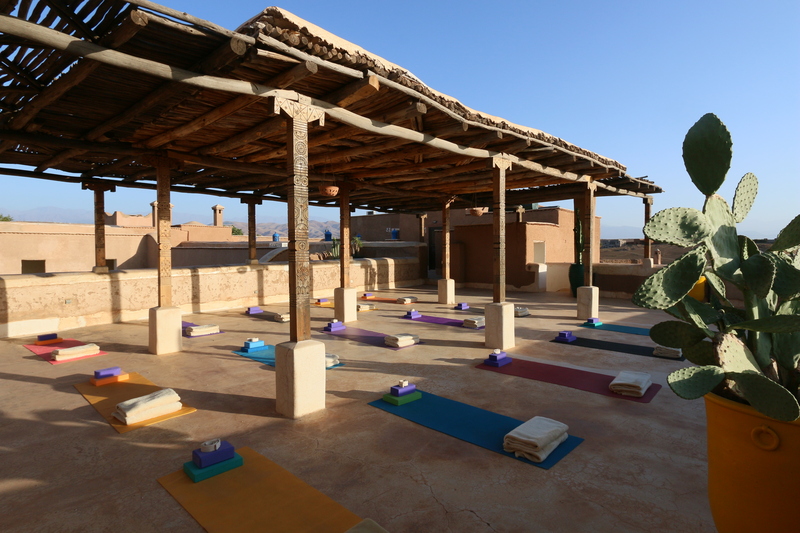 We will practice our yoga on the roof terrace overlooking the Atlas mountains. I will be teaching up to 3 yoga classes a day with a mix of yoga asanas (poses), pranayama (breathing techniques), guided meditation and Yoga Nidra. The afternoon can be spent basking by the pools, or book a hamman or treatment in the TIGMI SPA. 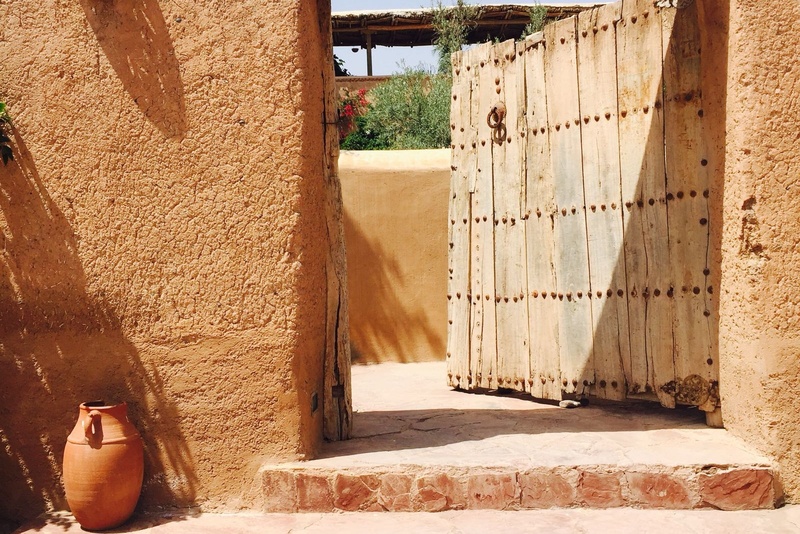 If you are feeling more energetic take the free shuttle to visit one of the souks in Marrakesh or go on one of the many interesting walks of varying distances that can be taken in every direction from Tigmi. Many other excursions can be arranged for you. TIGMI has an ‘excursions menu’ at reception so there is plenty on offer. A breakfast of delicious home-made juices, honey, yoghurts, pancakes, cheeses, locally made breads, fresh fruit and cereals will be served after class. There will be an ample and varied salad buffet lunch. The evening meals are traditionally North African dishes, with a mix of vegetarian and non vegetarian meals wonderfully prepared. Special dietary requirements can be catered for. Included: Accommodation, 3 meals per day, unlimited water, teas and coffees after dinner and all your yoga and meditation tuition. TIGMI offers a free shuttle van to Marrakesh a couple of times every day. Not Included:Flights, insurance and the airport transfer to and from the hotel which will be an added cost of £25 both ways -this will be put on your bill at the end of your stay. Tigmi has a beautiful spa for you to enjoy traditional Hammam baths, massages, facials and pedicures. These will be an extra cost. More information will be posted at a later date. 2. Transfer a deposit of £500 to Jane Macpherson (Bank HSBC. Sort Code: 40-43-41. Account Number: 72006200). Reference your name and ‘Marrakech 2019’. Please note that payment is non-refundable. However if you are unable to attend, I will do my best to find a replacement and refund your money – or you may know of others who can take your place. Thank you for your understanding.